Mr Chow, a Chinese restaurant in Knightsbridge, was a Sixties "in" place. I'd see Peter Sellers there, Princess Margaret - everyone who was anyone. The owner, Michael Chow, was low-key and charming. He had a delightful sister who acted under the name of Tsai Chin. She featured in one of the strangest movies I ever made, starring Frankie Howerd and Tommy Cooper, called The Cool Mikado. Mr Chow, the person not the restaurant, emigrated to Los Angeles where Mr Chow, the restaurant not the person, is a great success. The London branch hung around. No one I know ever visits it. So I was surprised when Robert Earl, the Planet Hollywood entrepreneur and Marco Pierre White's partner in Wheeler's, asked me there for dinner. Robert sometimes has the most enormous number of people join him for a meal. Far more than I can comfortably deal with. His Mr Chow night was such an occasion. I thought the place looked quite nice. One wall is mirrored. Some silver ducks hang on a rail like laundry. Our party of 11 was stretched along the wall. Amazingly, there were other people dining, also. There were no prawn crackers. I've never known any Chinese restaurant not have prawn crackers. Perhaps, I thought, this is so superior they're above prawn crackers. I was wrong. Some very ordinary fried prawns arrived. Then a dough-covered thing. "It's a deep fried won ton with prawns," said Marco Pierre White helpfully. "What's this red stuff, then, Marco?" I asked. "It's the squab," I think Marco said. Everything was bland. Tasteless really. I've never had bad seaweed in in any Chinese restaurant. Mr Chow's was rubbery. Then came a pork dumpling. "A bit burnt on the outside, Michael," observed Marco. "A bit burnt! It's black," I replied. "This is the worst Chinese food I've eaten in 100 years," I dictated into my tape. Then I thought: "I haven't lived 100 years." Never mind, you get the drift. We were given smoked chicken, which tasted of nothing. Then came an inferior lemon sorbet. After that we were shown two steaming roast ducks. They looked very healthy considering they were dead. The duck had no ducky taste. The flesh was much whiter than usual. I desperately tried to think of something nice to say. The service was good and the waiters were pleasant. was the best I could manage. Then some green prawns came, literally green, with rice. I stopped eating after a small taste. Until a tough lobster arrived. I couldn't manage more than a speck of that. By now we'd gone up to 14 people. People kept arriving and people kept changing places. Robert's daughters, Cara and Beth, were very charming. Beth was going to La Mamounia in Marrakesh and Cara's studying art. You can see them both in our photograph. The inevitable toffee apple and toffee banana were the best things the meal. As I finished them a boy band, Natural, arrived from Top of the Pops with another friend of Robert Earl's, a highly successful American boy band manager, Lou Pearlman. As I left, a charming and lovely lady at a table near the door greeted me. I'm hopeless about knowing who people are. I never remember names. It was only after I'd left I thought: "That was Trudi Styler, aka Mrs Sting." Why she was there I can't imagine. I hadn't been to Mr Chow for 35 years. I'm never going back. Lest you think I'm riddled with vitriol, here's news of some jolly meals I've recently enjoyed. At Zaika, in Kensington High Street, the chef Vineet Bhatia produced the best Indian dinner ever. It included a rose-petal soup and finished with a rose-petal ice cream. Le Caprice and the Ivy are still progressing brilliantly. Although it's rumoured they're about to be taken over again. Above a pub in Notting Hill is the astonishingly good Assaggi. It's run with warmth and charm by Pietro, front of house, and Nino, the chef. My veal chop was delicious. Going south to Beauchamp Place is another Italian restaurant featuring a great deal more plastic surgery, San Lorenzo. With its tireless hosts Mara and Lorenzo, it is deservedly the longest-running hit in the UK restaurant world. I had a superb bollito misto and the meringue with fruit is excellent. Staying on the Italian scene, the River Cafe run by Lady Ruthie Rogers, remains quite remarkable. I was with Lady and Lord Rogers recently in the tiny Ligurian seaside port of Vernazza. There Ruthie goes to learn from the local trattoria, Gianni Franzi. The food is exemplary and it's one of the - most unspoilt, beautiful places ever. I shall think of that instead of Mr Chow. What a relief. A way of guaranteeing good service at a restaurant would be to book a table at one of the many slated by MW on the usual spurious grounds and announce to the manager that you considered Winner's review to be a piece of typically ill-informed slanderous nonsense. They would recognise one's intelligence and discernment and perfect service would undoubtedly follow. I shall report further. 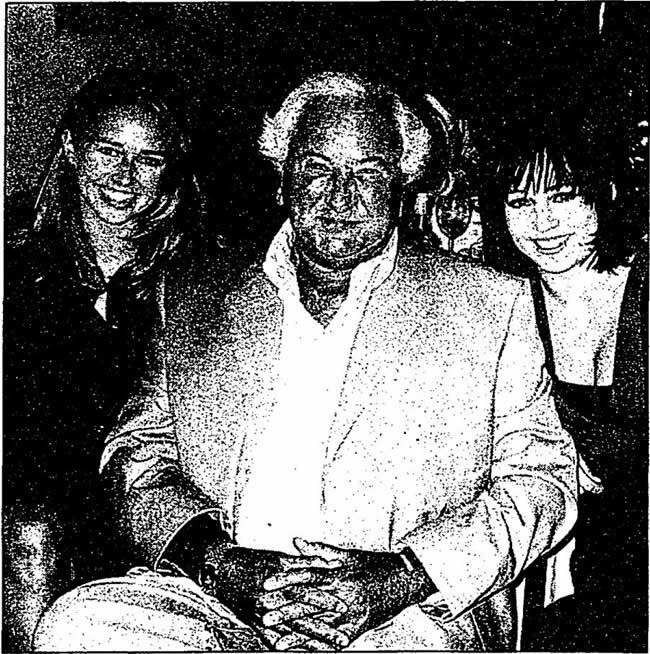 Michael Winner bemoans heavy traffic between Beaulieu and Golfe-Juan. Why doesn't he use the splendid train - cheap and efficient, with the stations within easy staggering distance of La Reserve de Beaulieu and Tetou at Golfe-Juan? Michael invites us to share our favourite tastes but says that tiny eels tried in olive oil would not "quite" make him return to Spain. May I invite him to try delicious chipirones, tiny squid stuffed with their own tentacles and fried in oil, which might just make him change his mind. Michael Winner describes Carlton Tower's beautiful young harp player, Nicola Broke, as a "harpist" (August 25). She is, in fact, a harpress, as any connoisseur should know. Suzanne Freg (Letters, September 1) has jumped on the "bad tipping Brit" bandwagon, and like so many others she is wrong! A bill for £100 includes Vat. Remove the tax and the food cost about £85 To give £12.50, the diner has in fact tipped almost 15%. I don't think that is "a nothing of a tip". Picking up on Ms Robertson's suggestion of a Losers' Boozers feature (Letters, August 25), Michael should address the problem of his girth with a calorie-controlled regimen. This will hopefully culminate in a Winner's Thinner column. While checking out of your favourite hotel, the Splendido in Portoﬁno, last weekend, we heard a sudden crash and saw that your photograph had fallen off the wall and was lying shattered on the floor. Is this an omen or just a rotten frame?